You can imagine dental care and hygiene was very poor during the Cival War in the USA. Toothbrushes were scarce as was treatment. A soldier's teeth were needed on the battlefields to bite off the end of powder cartridges on rifles. 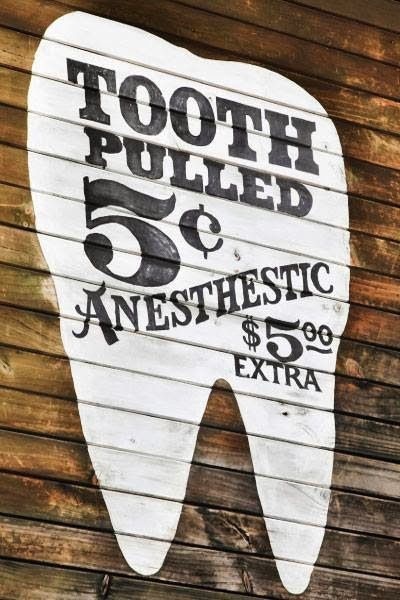 When the Union Army War Department rejected a dental program, the Confederate Army adopted one feeling it would give them an advantage! You hate to floss - don't you? The Victorians also loved their toothpicks. After dinner, a gentleman would produce a leather box, reach into its velvet-lined interior, withdraw his gold pick and begin grooming. Charles Dickens owned a toothpick inlaid with ivory and engraved with his initials; it retracted into its own handle like a tiny spyglass. In the 1870s, Asahel Shurtleff helped to civilize floss when he patented the first dispenser: a bobbin of thread with a U-shaped prong sticking out of its side. The prong worked like a tiny metal hand, guiding floss between the teeth. His invention anticipated the portable floss holders you can now buy in drugstores. Designers have since given us bubble-gum-flavored floss, Gore-Tex strands and tooth-shaped dispensers — all in an attempt to make flossing seem fun or at least not too difficult. Recent studies, meanwhile, have revealed that flossing might be one of the simplest ways to ward off tooth decay. Yet two centuries on, flossing remains the quintessential thing that we forget — and hate — to do. 49 – the percent of Americans who floss daily. Emergency Dental Visits Up 64 Percent Nationwide Day After St. Patrick’s. CNBC (3/17) reported in an online video that data shows emergency dental visits spike the day after St. Patrick’s Day because “people are just plainly behaving badly” and are accidentally “getting their teeth knocked out.” According to CNBC, emergency dental visits increase by 64 percent the day after St. Patrick’s day, and “nearly 10 states have more than a 100 percent increase.” The only state in which emergency dental visits decline the day after St. Patrick’s is Vermont. n 1812, the English novelist Frances Burney described her mounting terror as she prepared to undergo a mastectomy without any anesthetic. Having two hours to wait until the dreaded event (her 'execution', as she put it), she wandered into the room where the operation was going to take place and 'recoiled'. In an effort to control her fear she 'walked backwards & forwards till I quieted all emotion, & became, by degrees, nearly stupid – torpid, without sentiment or consciousness'. When seven men arrived, all dressed in black, Burney 'began to tremble violently, more with distaste & horrour of the preparations even than of the pain'. When told to mount the bed, she stood 'suspended, for a moment, [contemplating] whether I should not abruptly escape – I looked at the door, the windows – I felt desperate'. With the invention of chloroform in the 1840s, doctors celebrated the fact that the 'groans and shrieks of sufferers beneath the surgeons' knives and saws, were all hushed'. So said the surgeon-dentist Walter Blundell. Anesthesia lets us lose consciousness and then regain it. We're getting closer to knowing how general anesthesia works and the mystery of consciousness itself. When someone goes under, their cognition and brain activity continue, but consciousness gets shut down. For example, it has been shown that rats can 'remember' odor experiences while under general anesthesia. Anesthetics are fairly selective, subduing awareness while sparing non-conscious brain activity so the precise mechanism of anesthetic action should point to the mechanism for consciousness. In a new book , The Smile Revolution, the emergence of smiling (it grew slowly and exploded in the 20th century), is said to be attributed to a revolt against tradition, to the rise of dentistry, and especially to what he describes as a “shift in social practices and in sensibilities.” Suddenly, people were spending spare time in non-work, non-religious environments – coffee houses, salons, promenades – which “provided an accommodating framework for face-to-face encounters in which a smiling demeanour prevailed.” Suddenly, in other words, people had something called “spare time,” and needed smiles to fill it. According to historian Colin Jones, the first recorded smiles were cracked at the end of the 18th century. Before, in antiquity and in medieval and early modern times, the notion of revealing one’s teeth was considered unspeakably vulgar; we didn’t have words or concepts, in most languages, to describe the act. At the chloroform parties held in those early days of the discovery Miss Petrie was often chloroformed to show the pleasing effects the drug had upon a patient. She invariably made the same remark about being an angel." Dr. Thomas Dent Mütter was a pre-Civil War plastic surgeon who helped mutilated solders at a time before anesthesia. Prior to the discovery of ether anesthesia in 1846, all surgeries were performed with the patient fully awake. Many were restrained on the operating table by men whose job was to ignore the patients pleas, screams and sobs so that the surgeon could do his job. Dr. Mütter lived and worked in this world. He worked to improve his ambidextrousness so that he could perform his surgeries twice as quickly for his patients to limit their suffering. You'd think that once ether anesthesia was introduced, surgeons would globally embrace the innovation quickly. But the journey that ether anesthesia took was not that simple. For mid-19th century surgeons the norm was to perform surgeries on fully-conscious patients — this standard had spanned the entire history of surgery. And anesthesia's discovery was discovery was at a time when there was no guarantee of quality when it came to medications. Sometimes the ether or later chloroform mixture was too weak, and the patients wouldn't lose consciousness or would regain consciousness mid-surgery. Or the mixture would be too strong, and the patient would die from an overdose. As well, doctors at the time also debated about whether the thorough washing of hands and instruments for surgery was necessary. Lack of cleanliness in the operating room led to deaths not from bleeding or the trauma and stress, but from infections after surgery. The discovery of ether anesthesia certainly opened bold new possibilities when it came to the art of surgery, but without the antisepsis practices that would be embraced by later generations of doctors, the mortality rates for ether surgeries were not terribly different from the surgeries where the patient was thrashing on the table. The medical community was slow to accept anesthesia but some doctors like Mütter understood that, the positives far outweighed the negatives. For years after its discovery, hospitals and medical schools would ban its use. Prestigious doctors and dentists would publish damning writings calling the drug "satanic influence," and decrying doctors who used it by saying they had been "seduced from the high professional path of duty into the quagmire of quackery by this will-o'-the-wisp." And patients, in operating rooms and dentist's chairs across the country, would suffer unimaginably as the debate raged on.